A sink overflow can create more than just a wet mess in your household. If it gets out of control, it can result in indoor flooding and serious water damage on your property. It can also create health hazards as sink water is unsanitary, making it a catalyst for fungal, viral and bacterial growth. To deal with an overflowing sink, your best line of defense is always to prevent it from happening in the first place. Don’t dispose of food scraps through your sink. They may fit in the drain, but as more and more food particles accumulate, they can form a solid clog that will restrict water movement. Just because fat, oil and grease look fluid doesn’t mean they’ll go right along with water to the sewers. These substances can deposit and solidify in your drainage pipe and cause a clog later on.Visit ceasethegrease.org to learn more about proper grease disposal and avoid FOG related clogs. Avoid getting hair into your sink. Like solid food particles, hair can accumulate, ball up and create a barrier that prevents the escape of water into the sewage system. Always have a drain cover to filter out large, solid objects that may fall into your sink’s drainage pipe. Remove them only when cleaning your sink. Don’t let your kids play with water in your sink. Children can get very creative and they’ve been known to try and flush small toys down sink drainages. Action figures and toy cars are some of the most difficult clogs to clear, so educate your kids on this subject early on. Shut off the faucet that feeds water to your sink. This stops additional water from making the situation more complicated than it is. Use a pitcher or any large container that you can find to get as much water out of your sink as possible. Dispose this water outdoors or let it run off in another sink or toilet. Obviously, this water is unsanitary and you wouldn’t want to use your bath tub drain to get rid of it. Use a plunger to try and clear the clog. Push it up and down over your drain and see if the water starts subsiding like it normally does. If the clog doesn’t clear, it may be time to do some mini-plumbing work yourself. Take a bucket and place it under your sink’s drain trap. That’s the J-shaped pipe under your sink. Loosen the fittings until your drain trap comes off. Empty the water in it to the bucket. Use a wire or a plumbing snake to clear the drain trap of whatever clog is in it. You can also run hot water through it to loosen fats, oil and grease that may be clinging inside. Once the drain trap clears, run tap water through it to make sure fluids can pass through with no obstructions again. Re-install the drain trap and let tap water run through your sink for a few minutes. If water doesn’t stagnate in your sink, you’re good to go. 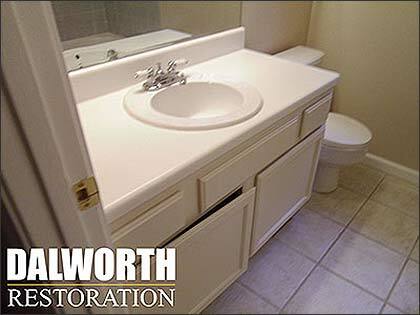 At Dalworth Restoration, we understand that not everyone has the time and energy to fix an overflowing sink. We’re happy to tell you that we’re standing by 24 hours a day, seven days a week, all year long to take your call and help you out. Call us now to get friendly assistance from our knowledgeable staff. You can also drop an inquiry over at our Contact Us page. For all your water overflow needs in the Dallas-Fort Worth area, trust in Dalworth Restoration to get the job done.